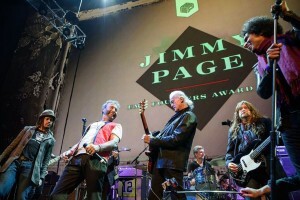 On Thursday night Jimmy Page took to the stage at the finale of the EMP Founders Award. Jimmy was in attendance to receive the annual Founders award for his exceptional influence on music. 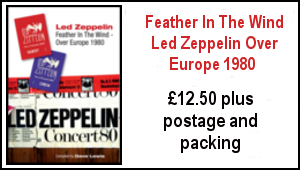 A host of musicians paid tribute to him during an evening of star filled Led Zep performances. Though it was unplanned Jimmy got up and performed Rock And Roll . This was Jimmy’s first on stage performance since he guested with Roy Harper in 2011. It’s an absolute joy to see Jimmy stomping the stage in time honoured fashion Gibson Les Paul in hand. ”I want to do what I do well which is play guitar and surprise people. I really want to be seen to be playing” – that’s what Jimmy told me when I interviewed him last year. Dave Lewis, November 21, 2015. 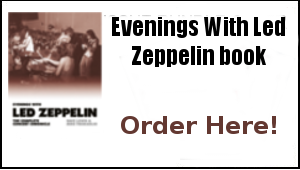 For the entire night, the party line was that there was absolutely no way that Jimmy Page was going to perform. 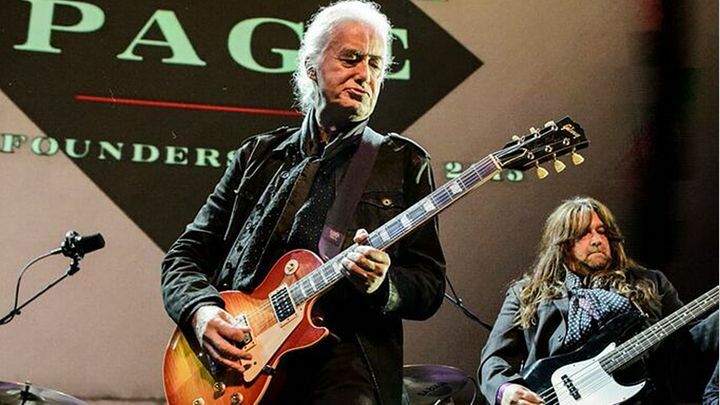 No matter that this event, a benefit show held Thursday at Seattle’s Experience Music Project Museum, was built to honor the guitarist; Page’s people insisted that he wasn’t going to take part in the festivities. The vocals by Paul Rodgers (Page’s old bandmate in the Firm), Alice in Chains singer William Duvall and John Hogg were muffled and all over the place, and Page’s soloing was shaggy and tentative. Perfection wasn’t the point. When eight guitarists, including Soundgarden’s Kim Thayil and Cheap Trick’s Rick Nielsen, are pounding out that familiar boogie-blues riff at jet-engine levels of volume, no amount of gaffes were going to clean the smile from a spectator’s face. The biggest grin of the night belonged to Page. There to receive the EMP Founders Award, an honor bestowed in the past on artists such as Ann and Nancy Wilson of Heart and Jackson Browne, and then sit in the audience while a cadre of Seattle’s finest musicians and a smattering of special guests ran through classics from throughout his five decades as an artist and producer, he never stopped beaming the whole night. The players and singers that were brought to EMP last night to reflect Page’s greatness back to him were, by and large, part of an era of musicians who carried that baton. The house band featured a rhythm section made up of former (and maybe future) Guns N’ Roses bassist Duff McKagan and ex–Screaming Trees drummer Barrett Martin, and the other cast of characters came mostly from that same Eighties/Nineties era. Guitarist Rich Robinson, whose band the Black Crowes once toured with Page in the early 2000s, put his own twist on the familiar riffs of “Custard Pie” and “Ten Years Gone,” before laying into an acid-dripping solo on “Dazed and Confused.” That dark spirit didn’t get invoked again until Thayil was brought out to calmly tear his way through “Immigrant Song” and a particularly beastly version of “Out on the Tiles,” also featuring Nirvana’s Krist Novoselic. 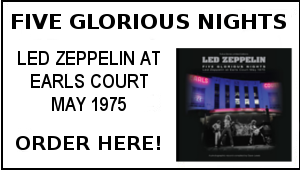 The night also took some pleasant diversions into Page’s pre- and post-Zeppelin career. Nielsen shuffled on stage to add some tasty psych-rock weirdness to a run-through of “Happenings Ten Years Time Ago,” a 1966 single originally recorded by the Yardbirds. And Rodgers proved a still-agile showman and vocalist as he took the band (joined as well by Tesla bassist Brian Wheat) on a tour through two tracks from the Firm’s 1985 self-titled album. There was a small nagging feeling that the show, as great as it was, could have been even better. Apparently the current touring schedules for many of the artists that EMP had on their long list of hopeful participants conflicted with the date of the tribute. If you know anything of the history of Seattle music, it was pretty easy to pick out the glaring absences. One of the guitarists most indebted to Page’s fluid playing and sound, Pearl Jam’s Mike McCready, only appeared via a small video testimonial. The same went for Ann and Nancy Wilson of Heart, the sisters who reduced Robert Plant to tears with their rendition of “Stairway to Heaven” at the 2012 Kennedy Center Honors. It also needs to be said that theirs were the only female voices heard all night long (Lucinda Williams was booked to perform, but she backed out at the last minute). Apart from the overemphasis on Y chromosomes, though, those quibbles are the result of after-the-fact analysis. No, it wasn’t a perfect evening. None of the songs went off flawlessly, with dropped notes and the occasional limp solo popping up throughout. (And it was particularly charming watching the band struggle with the rhythmically jagged “Four Sticks.”) But those minor flaws were easily overshadowed by the sheer enthusiasm and visible bliss of the people onstage and completely outshined by Page’s beatific smile. Dave Lewis/Gary Foy – November 21, 2015. If you are reading this and have yet to link with the Tight But Loose Facebook page be sure to request/add us. 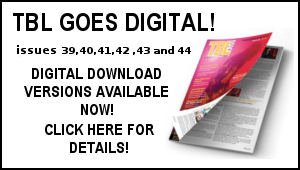 The TBL Facebook is another key part of the TBL set up with updated stories/additional pics etc to keep you on top of the world of TBL. Awesome to see you back on stage, Jim! Last time I saw you play was the Teenage Cancer Trust Show at the Royal Albert Hall (when was that? 2001? 2002?) Please keep playing – would be awesome to see you kick it on stage a bit more. Maybe seek out Norman Hale for a jam – he’s love that. A joy to see Jimmy kick in’ it back on stage after 4 years ! Last saw him with Roy at the Festival Hall in Nov 2011. Just proves how fellow musicians still look up to him with Kim,Duff,Rch Robinson et al. Particularly nice to see him playing again with Paul ( the Firm were totally under rated). Please don’t leave it another 4 years Jimmy !